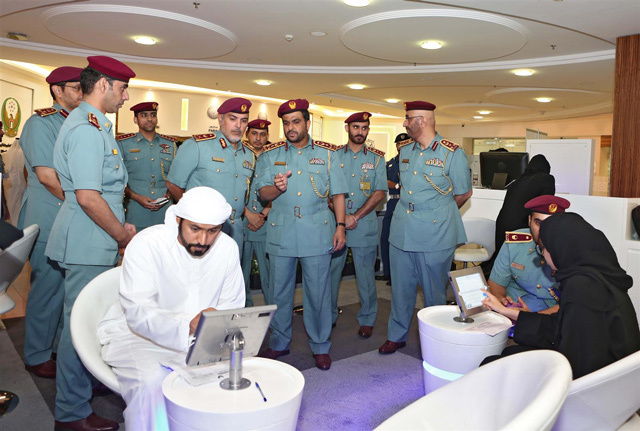 The Abu Dhabi Police has launched a client self-services platform that allows them to access its various online services, including security and traffic services and other innovative services, with the aim of making the public happy. Major General Maktoum Ali Al Sharifi, Director-General of Abu Dhabi Police, inaugurated the platform at the Drivers and Vehicles Licensing Department in the Central Operations Department yesterday. The platform is designed to serve the public while considering the needs of people of determination. Its implementation plan includes providing access to its services in several services centres and shopping malls in Abu Dhabi, Al Ain and Al Dhafra. Al Sharifi stated that the platform reflects the move to a smart government, to facilitate public access to police services according to the applied international standards in this area. He added that the development of these services of Abu Dhabi Police achieves its vision to make Abu Dhabi a safe and secure community, by providing high quality police services to the public that will contribute in enhancing the index on the satisfaction about these services, which are constantly updated to comply with similar services in developed countries. Al Sharifi highlighted that Abu Dhabi Police has implemented initiatives and strategies that aim to continuously develop its current services and provide new innovative services, by benefiting from the human resources and modern technologies that promote the UAE's standing in international competitiveness indexes.